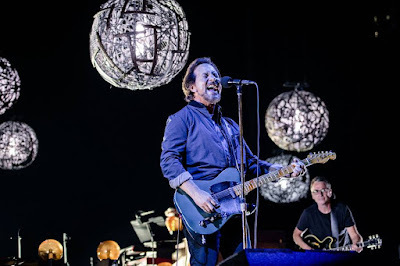 Pearl Jam launched the European leg of the Live 2018 Tour with the first of two sold-out shows at the Ziggo Dome in Amsterdam on June 12, and video from opening night is streaming online. As Spin reports, Eddie Vedder dedicated the show to the late Anthony Bourdain, as well as David and Andy Spade – brother-in-law and husband, respectively, of designer Kate Spade; both Spade and Bourdain passed away last week. The band will wrap up their summer European concert run at the NOS Alive Festival in Lisbon, Portugal on July 14, after which they will play a series of select US stadium concerts in August. The group will begin the US shows at Seattle’s Safeco Field on August 8 and 10 while pledging a minimum of $1 million toward local homelessness initiatives while challenging everyone to join them towards raising a minimum of $10 million for the cause.